I had another SSD failure on one of my AA1's the other day, and had run out of replacements .. the 16Gb Super Talent replacement SSD's I've used previously were all sold out, and the 32Gb version was over £90 which is ridiculous. £26 including postage .. came 2 days later. The stock ZIF ribbon cable from the SSD fitted straight in (after some initial effort). Thanks for the link etc. Is it still performing ok? BTW my SSD is 16 gig, but I presume it will still work ok.
Don't worry Mark, too far to send the heavy mob, if all goes wrong. I'll let you know how I get on, but it might take a couple of weeks. If you haven't already ordered one, you might want to wait a while. I'm starting to hear some odd sounds from the drive, and once if failed to be recognised whilst making a ticking noise. It's in one that belongs to my son, so it could be that he's mistreated it .. or it may be symptomatic of an upcoming failure .. you might want to wait and see. Is the clicking manifesting when on battery or all the time? I had a similar problem with the Eeepc where on battey it was clicking every 5 sec or so. To set HDD advanced power management to it's lowest value. If that makes it go away then you know what to do. This isn't disk power management related, and is highly unlikely to be software at all ... it's doing it in Windows and Linux .. and has locked up three times now. I'm gonna try repositioning the drive tomorrow as they look slightly delicate .. it may be being squashed a bit by the way I padded it out. I am not able to understand if I did an error installing the HDD (ATA error) or if there is a defect on the driver. I used a new ZIF cable, since I damaged the original one. It is possible I used a wrong cable? Please help me... I spent money to restore my old Aspire One do not trash it! Dunno what to tell you .. I had exactly the same problem, I'm can only assume the HDD's are incompatible. It worked for a few days, then I started to get errors all over the place and failed completely .. maybe the voltage is wrong or not stable enough, or maybe those 1.8" HDD's are just shite .. dunno. I do know the AOA150 had the same motherboard but had a standard SATA connector .. the SATA controller is still present on the AOA110L motherboard .. so it's not beyond the realms of possibility that you could solder one on. Beyond that I don't think I can help .. sorry. I bought a zg5 8gssd version in september. first i bouht an 64gb zif ssd at the local store, it fit in well but did not worked. I took back, they tested it and agreed with me that it was defected, they can't give a new one because that was the last one, so they gave back the money. After i bought an zif to msata adapteer on ebay, but on that the ribbon cable was to thick, it did not fit. Now i ordered a new setof ribbon cable. So you don't think it is the cable? I understand that there are ZIF and reversed ZIF, but I didn't understand clearly the difference. In any case the vendor is sending me a new HDD: he declared compatible with AspireOne. As I know, voltage are standard. Reversed = the exposed contacts are on different sides of the cable. It may well be your cable, it may also be the HDD, or it may just be the case (if you've closed the case). the reason I say it may be the case is I've just had another look at the AA1 with the Samsung HDD and if I opened the case it started working and stopped making that weird noise. What make and model of HDD are you attempting to fit ? No problem, I suppose that the scope of the forum is share experience also, not only have the right answer! 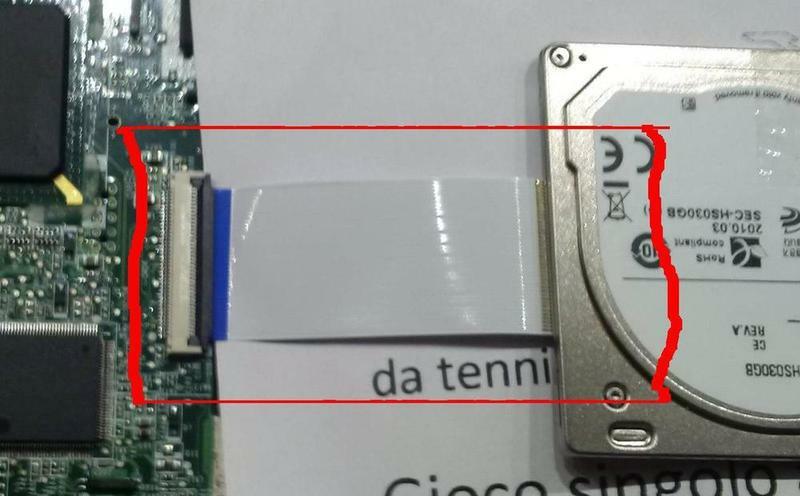 The HDD is HS030GB, declared compatible with AspireOne by the seller. I replaced the original cable and I tried two one with the same bad result. Also the seller of cable declared that are compatible with Samsung HDD. Only a note: is the difference between reversed are not are only the side of the contact, there is no issue using one or the other, if I connect the cable in the right side of the connector. Correct? I removed some plastic from the case and I used tape to fix the HDD. Also I added 512 of RAM. OK, I'll be pulling mine apart again tomorrow to replace the RAM upgrade .. I'll then post if the contacts on my ribbon cable are on the same side, or opposite sides. The vendor sent me a new HDD. Now is working!!! !